The Diamond Way Buddhist Centre therefore featured as the final stop on the Interfaith Walk, which took in five of Lambeth’s religious venues, encompassing the regions of North Brixton, Kennington and Vauxhall. The walk was attended by around 30 representatives of Lambeth’s Christian, Jewish, Muslim, Hindu and Buddhist communities, including four friends from the London Diamond Way Buddhist Centre. 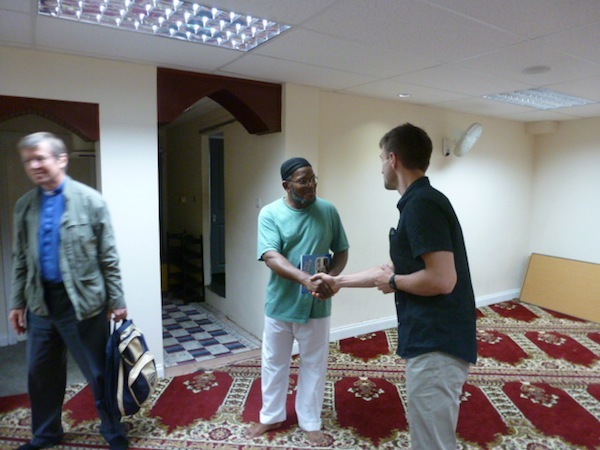 The tour started at the North Brixton Islamic Cultural Centre, (also a known as Masjid-ul-Qudus, “The Holy Mosque”), which is situated at 180 Brixton Road. After coming together outside the Islamic Cultural Centre the the interfaith visitors were segregated into male and female groups, and proceeded into separate rooms in the building’s basement, which is used for prayers. Unfortunately, the local Sheikh who was expected to greet the group did not arrive. However, a kind gentleman called Daniel, one of the local worshippers, was on hand to answer questions from the male group members, while the ladies were shown around by a female worshipper. Questions concerned a range of topics, such as the history of the mosque. The Islamic Cultural Centre was founded by members of Lambeth’s Sierra Leone community, although it was unkown exactly which year this happened, perhaps 15-20 years ago. One of the interfaith visitors who worked for Lambeth council in the 1980s remembered it being a council office in those days. Other questions concerned the number of worshipers (up to 5,000 on Fridays, when the congregation sometimes spills out onto the street), and how Muslims know in which direction to pray (apparently this has been made possible in present times through smart phone technology). When asked why men and women were segregated, Daniel replied that this was part of the Islamic faith and it is practiced in Islamic societies. During prayers apparently, Muslim men can be distracted if there are women present. Presumably it was more down to custom why the interfaith group was segregated, as the visitors were not asked to perform prayers during the visit. Next on the agenda was the Scalabrini Centre at the Holy Redeemer Church on Brixton Road. More information was made available here for the visitors. 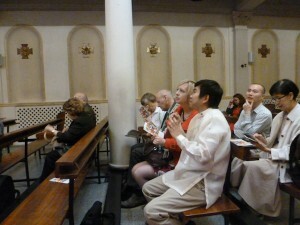 The church belongs to Scalabrini Fathers’ Mission in London, a congregation of the Missionaries of St. Charles Borromeo. It is an expression of the Catholic Archdiocese of Southwark’s pastoral care of migrants. 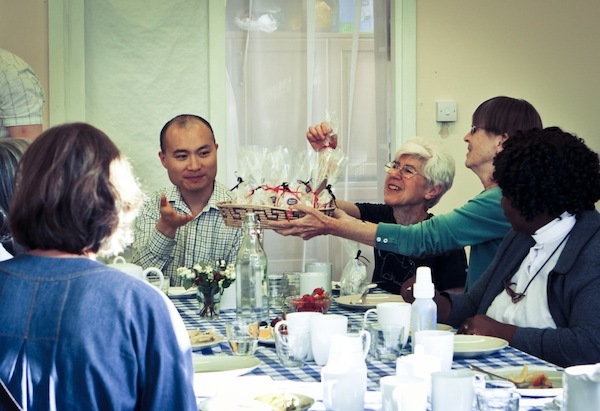 The Scalabrini Centre describes itself as a community of different people and cultures, living together under the same roof, whilst still maintaining their own identity. 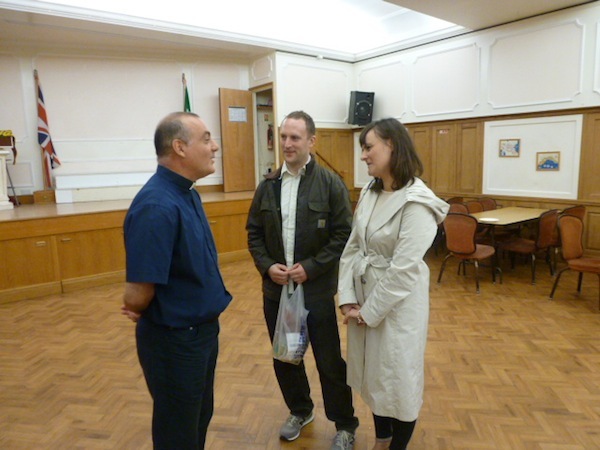 Father Francesco from the Scalabrini Centre welcomed the group and explained that the Congregation was founded in 1887 by the Italian bishop Father John Baptist Scalabrini to serve Italian migrants in a period of massive emigration from Europe toward the Americas. 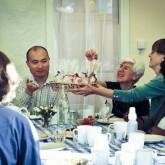 In the UK today, the mission does pastoral work with three main migrant groups according to their needs: Italians, Portuguese and Filipino. The mission started in the UK in the 1950s after the Second World War, with Italians working in Bedford. In the 1970s a second Italian mission opened in London (the first being St Peter’s in in Clerkenwell), in the South London diocese. The present building on Brixton Road has been home to the congregation for around 20 years and features a remarkable painting representing the ascension of Jesus as well as several important statues that have been brought by migrants including Our Lady of Fatima and Santo Niño (important to the Portuguese and Filipino devotees respectively). Members of the Italian and Filipino communities then gave overviews of their activities. 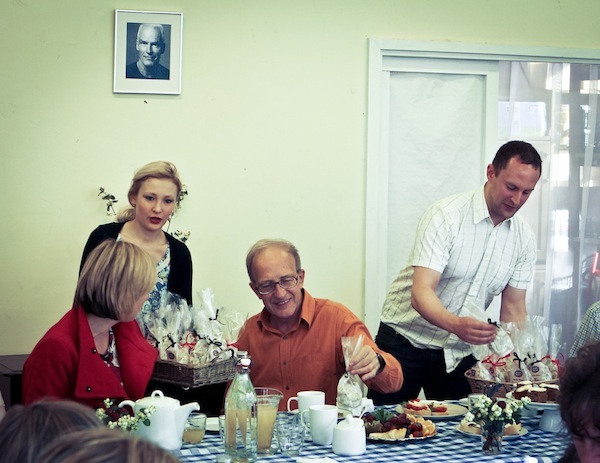 For example, the Scalabrini Centre’s Women’s Club started in 1988 and runs social and fundraising activities. 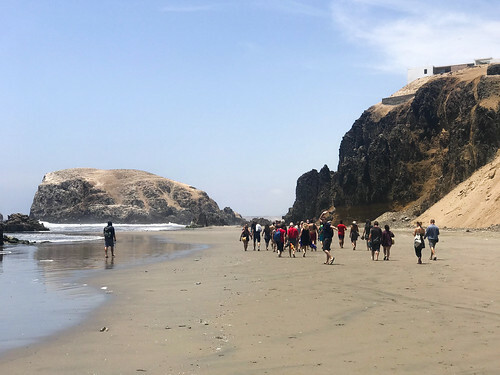 It has raised £1 million for children suffering from leukaemia and organises overseas travels once a year to places including Russia, China and Africa. Father Francesco led the interfaith group in a prayer for peace in Syria and the world. The group then went downstairs into the social area to network while enjoying some snacks and refreshments. The group departed and proceeded to the next venue, the Jamyang Buddhist Centre on Renfrew Road, Kennington. 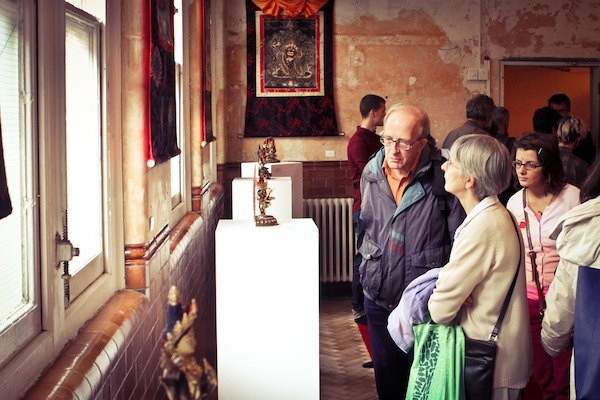 Jamyang belongs to the Foundation for the Preservation of the Mayayana Tradition (FPMT), a Buddhist organisation with a long and distinguished history in the UK. 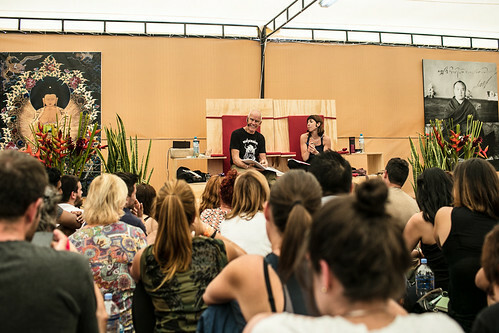 The group were invited into the main “gompa” or meditation hall, where they were given an eloquent introduction to the centre and its activities by John, one of the local centre members. He explained that Jamyang is Tibetan for Manjushri, the Buddha of Wisdom, so the centre’s name means “Temple of the Buddha of Wisdom”. The building was originally a Victorian court house which opened in 1869 and operated until 1970. It is a Grade II listed building and contains many protected features. The beautifully crafted statue of Buddha Shakyamuni, for example, now sits under a wooden canopy where the Judge would have sat to deliver justice. The court featured considerably in proceedings for trials of IRA terrorists, the Kray brothers were held in cells now converted into bedrooms, and there is still razor wire in places, but a lot has changed since those times. 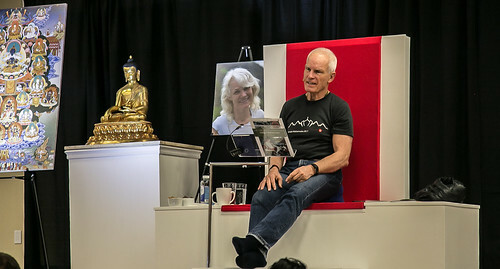 John explained that the goal of the meditation practiced at the centre is to transform one’s mind from a selfish, negative state to a more positive state that focuses on others. As well as being a Buddhist centre, other charities are run from the building. One is the Courthouse Community Centre, which runs a respite project for carers who live in the community and the courses on mindfulness-based stress reduction (“meditation with Buddhist terminology stripped out of it”), which the NHS is interested in as it can be effective for dealing with depression. Another charity based in the old courthouse is the Foundation for Developing Compassion and Wisdom, an education programme for adults and children that takes Buddhist ethics and transforms them into something that has an effect on the community without proselytisation. Finally, the centre is also a custodian of relics of the Buddha and other Buddhist masters which have featured in “relic tour” exhibitions, for example one which members of Diamond Way were recently invited to attend. The FPMT follows the Gelug (which means Virtuous) school of Tibetan Buddhism, the school of H.H. Dalai Lama. 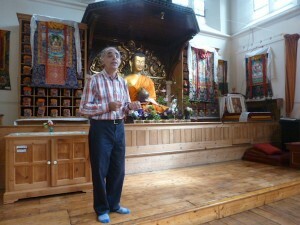 The Jamyang Centre has hosted H.H. 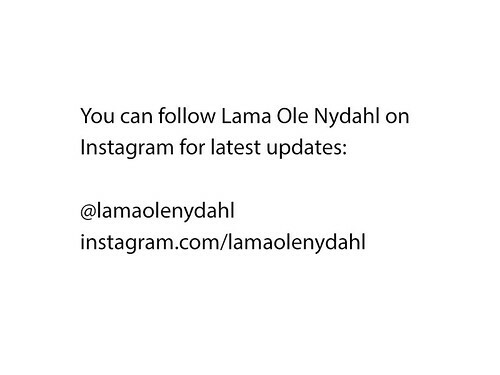 Dalai Lama and invites other prominent lamas affiliated with the Gelug school. 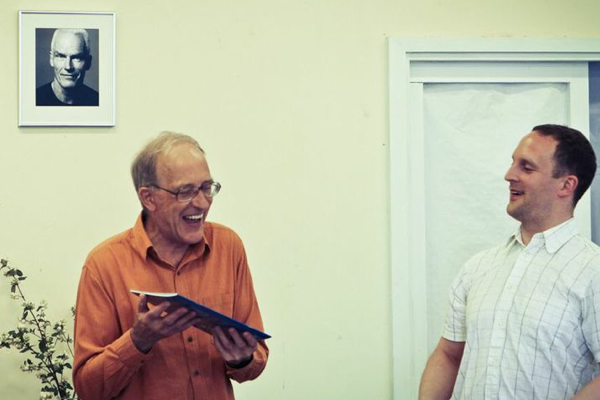 Diamond Way Buddhism UK and the Jamyang centre have always maintained cordial relations and the two organisations, as new neighbours, are building on the atmosphere of harmony that has characterised Buddhist interactions in South London in recent times. As is often the case between different streams and traditions of Buddhism, there is more in common than there is that divides. For example, each centre teaches authentic Buddhist methods passed down in unbroken transmission lineages from the Buddha. Furthermore, members of both organisations share the utmost respect for H.H. Dalai Lama as a protector of Tibetan Buddhism, and support the Tibetans’ struggle to maintain their religious culture in the face of relentless pressure from the Communist Party of China and its fellow travellers. Indeed, Jamyang’s Spiritual Director has been joined in recent years by the MP for Vauxhall, Kate Hoey, who is a member of the All Party Parliamentary Group on Tibet and stalwart supporter of the Free Tibet movement, to lay wreaths at Westminster Abbey on the anniversary of the Tibetan uprising against the the People’s Republic of China’s occupation of Tibet. The group enjoyed their packed lunches in the garden of the Courthouse Cafe. The cafe is run by the Jamyang centre, and features a statue of the Buddha entering into Parinirvana upon his death. The Buddha died after eating meat which had turned bad. Fortunately Jamyang’s cafe serves strictly vegetarian fare! 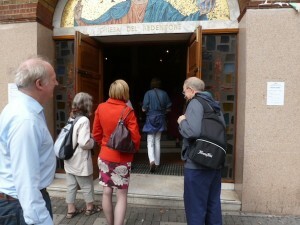 The next stop was St Anselm Church on Kennington Cross. 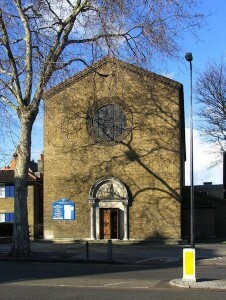 Diamond Way Buddhism have already established a relationship with St Anselm’s, it being the closest neighbourhood church. 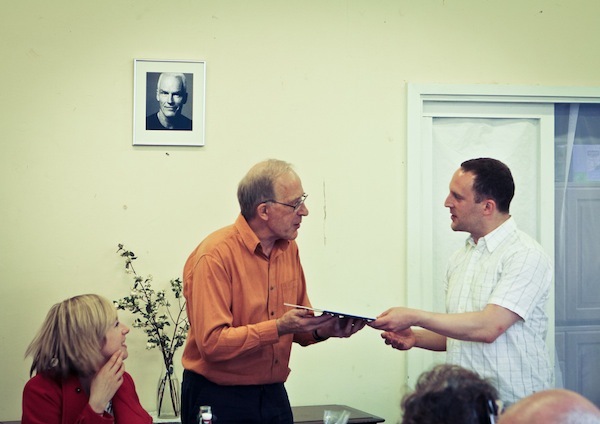 For example, in March 2012, the London Centre was involved in a Community Volunteering Recruitment event with the Kennington, Oval & Vauxhall (KOV) Forum that took place at St Anselm’s. 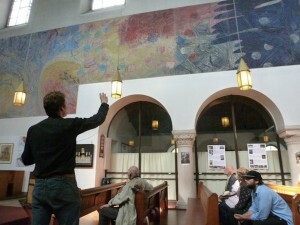 David, the Associate Rector, gave an overview of the Church’s history and current activities. St Anselm’s belongs to the Church of England. Together with St Peter’s and St Mary’s Lambeth Mission (Methodist), the church serves the 24,000 people in the parish of North Lambeth which extends from Vauxhall Bridge to Oval along Kennington Park Road, dissecting the Imperial War Museum. 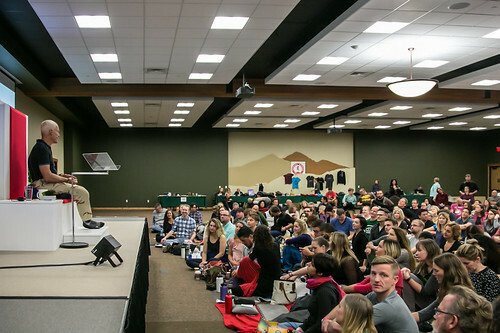 On a Sunday, 130-150 people are usually in attendance. Construction of the church started in 1914, but with the onset of the First World War, funds ran out, so the original architectural vision of a Byzantine structure with a dome to match the Imperial War Museum, was never realised. Nonetheless, the current building with its striking height and length was completed in 1936. In a very engaging and thought-provoking presentation, David explained his understanding of the colourful murals surrounding the inside of St Anselm’s main hall. These paintings were made by the royal academician Norman Adams and installed in the 1970s. They are based on the book The Pilgrim’s Progress by John Bunyan, which was written at the time of the Glorious Revolution. David explained that as the second largest land owner in the country, the Church of England has engaged in projects to use its assets in new ways to meet the needs of the communities it serves. In this spirit, St Anselm’s Rector Angus Agaard has transformed some of St Anselm’s buildings as part of the community charity project known as Pathways at Kennington Cross, which aims to help deprived people in the area by creating a new community hub through redeveloping St Anselm’s. There is now a nursery for children, and eleven “business incubator” units. 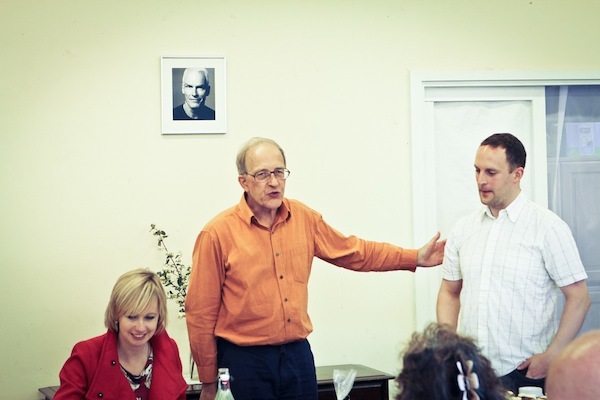 These units are for use by people who have recently come out of prison, and help them to kick-start businesses as they re-integrate into the community. Pictures proudly displayed in the church show the January 2013 visit to St Anselm’s by The Prince of Wales and The Duchess of Cornwall, who had come to learn about the Pathways project. David explained that the jewel of the Pathways project will be a new restaurant that will provide work, training and accommodation for ex-offenders as they return to the community. 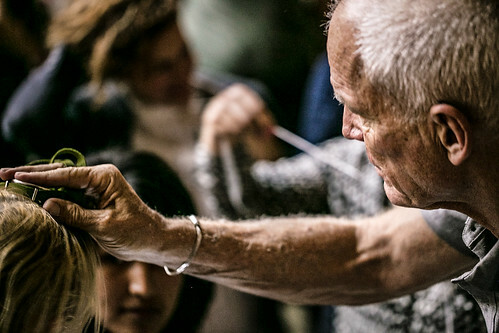 This follows a Christian imperative to help those in prison. 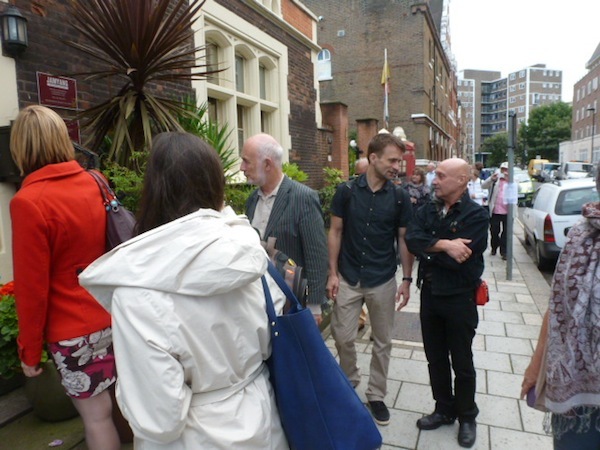 David joined the interfaith group for the brief walk from St Anselm’s, up Black Prince Road, to the final stop, the new London Diamond Way Buddhist Centre at the Beaufoy Institute. Although yet to open to the public with a regular meditation program due to the progressing renovation work, the centre has hosted a number of events and open days for locals in recent months, as well as hosting visits from our teachers such as H.H. 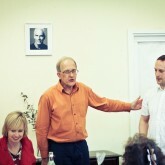 Karmapa, Sherab Gyaltsen Rinpoche, and Lama Ole Nydahl. 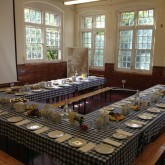 On the weekend of 7-8 September the centre was serving as a host venue for the Mayor of London’s Thames Festival, one of the largest river-focussed arts festival in the world. 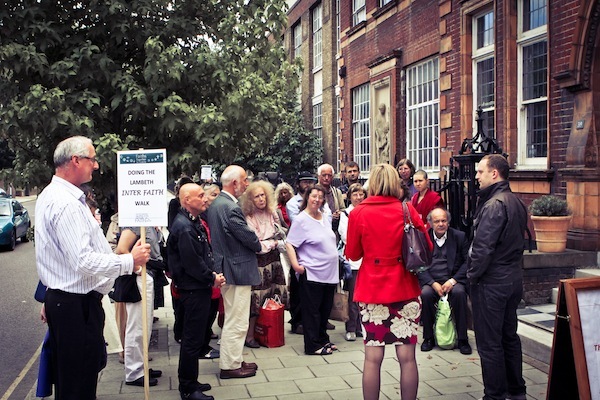 The London Centre’s “Friends of the Beaufoy” project had organised the Vauxhall Ragged Schools Tour and Open House. 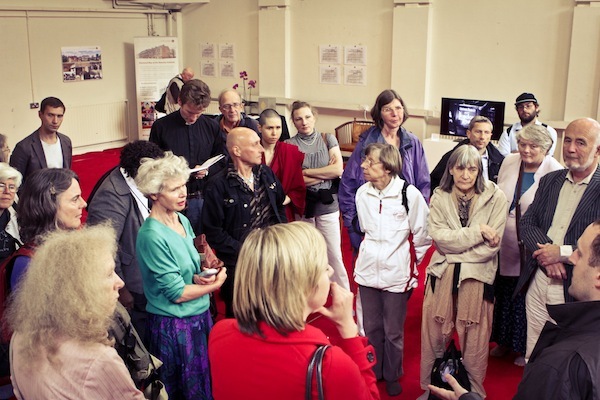 The Open Days programme included a film loaned from the British Council, with whom the London Centre had worked together on a Buddhist Art exhibition in Lambeth in May 2012. 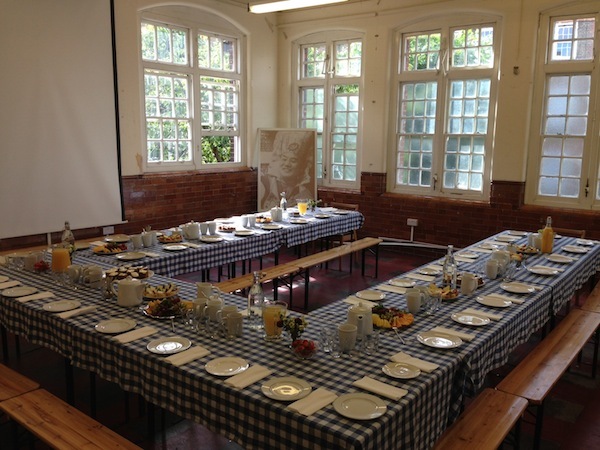 The interfaith group were given a guided tour of the building, starting with the main hall, which featured an exhibition showcasing the history of the Beaufoy institute. Members of the Diamond Way Buddhist Centre then gave a brief introduction to the Centre and the central values of its practitioners. In common with the teachings explained so eloquently at the Jamyang Centre earlier in the day, Diamond Way Buddhists share the motivation of the Great Way (Mayahana) to reduce ego clinging and become able to benefit all beings in an ultimate sense. In particular Diamond Way Buddhists try to integrate into daily life the teaching that all beings possess Buddha nature, and that the essence of consciousness in all beings is perfect and ultimately one. From this “pure view”, compassion naturally arises for others, and this is the foundation on which practitioners of Diamond Way have engaged in interfaith activities, for example the celebration of friendship in 2005 in which H.H. 17th Karmapa made the keynote speech. The visitors asked many questions, including one concerning the role of women in Diamond Way Buddhism. It was explained that from the view of Diamond Way, the male principle is related to compassion, and the female principle wisdom. 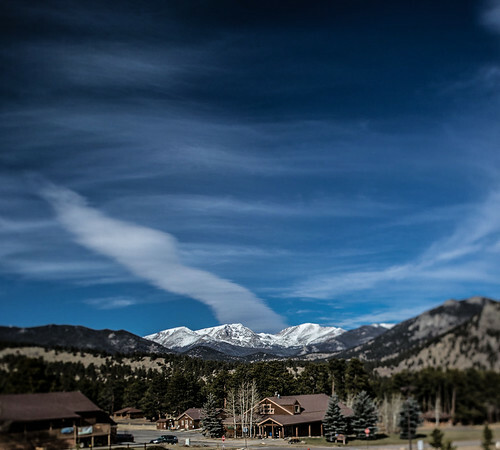 As a non-monastic, lay tradition, this means that men and women have a great opportunity to open up to and learn from these qualities in each other. In terms of the Western lay Buddhist teachers who give lectures and courses in Diamond Way Buddhist centres, there is a 50/50 split between men and women. It has also been said by great Vajrayana masters such as Padmasambhava, that the bodies of men and women are equally suited for the accomplishment of wisdom, but if a woman has strong aspiration, she has higher potential. 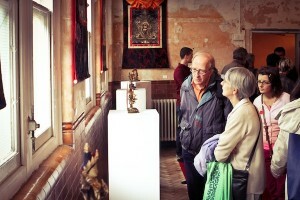 The group were then led into the small meditation hall, which had been rearranged for the Thames Festival as an exhibition of Himalayan Buddhist Art from the centre’s collection and the personal collections of its members, many of which are used as supports for daily meditation practice. The symbolism of the exhibition was explained as a field of refuge, with the different Buddha forms acting as mirrors for the perfect qualities of body, speech and mind, inherent in all sentient beings. 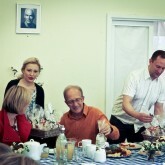 Afterwards the group enjoyed tea, cake and refreshments in the temporary welfare kitchen, which had been immaculately prepared for the occasion. 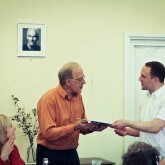 Before departing, there was an exchange of gifts. 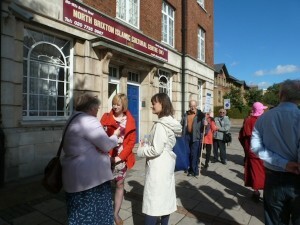 Members of the London Diamond Way Buddhist Centre presented Rev. Alan Gadd and the other participants in the Faiths Together in Lambeth interfaith walk with gifts, including packets of delicious home-baked “Beaufoy Biscuits” and miniature framed prints of the Kalachakra mantra, a powerful blessing for world peace. Rev. 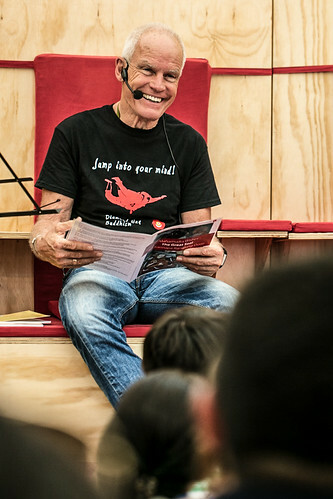 Alan Gadd presented a copy of “Talking Together: Conversations About Religion” by Sarah Thorley, a book about conversations between young people of different faiths. 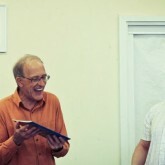 Feedback from the participants was very positive and afterwards Rev. 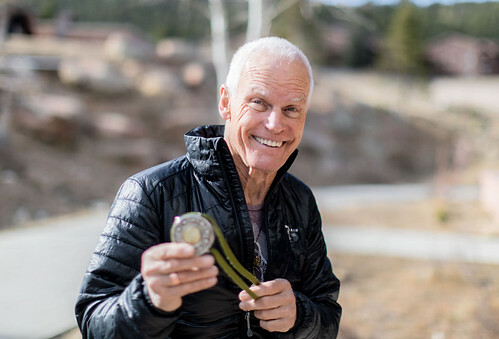 Alan Gadd sent a kind message of thanks to all those involved. 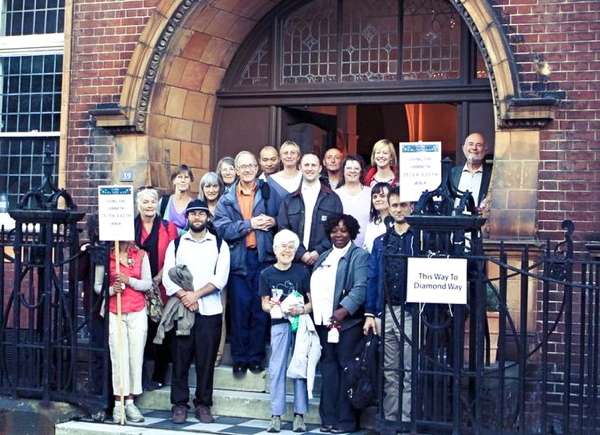 The London Diamond Way Buddhist Centre is happy to be taking part in Lambeth’s interfaith life and looks forward to further strengthening positive relations with South London’s faith communities. 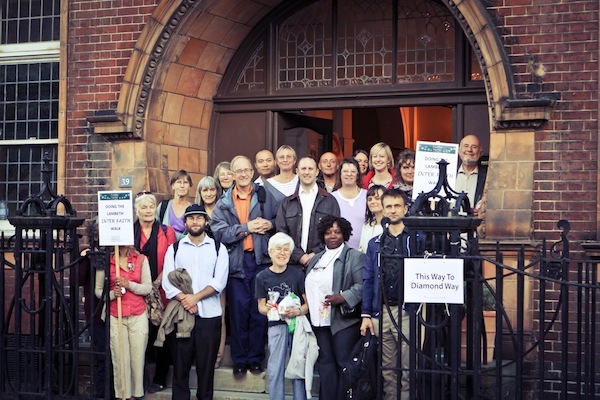 Now that we’re here to stay in Lambeth, the signs will say “This Way to Diamond Way”! This entry was posted on Saturday, September 14th, 2013 at 11:35 am and is filed under Diamond Way Buddhism, Interfaith. You can follow any responses to this entry through the RSS 2.0 feed. You can leave a response, or trackback from your own site.